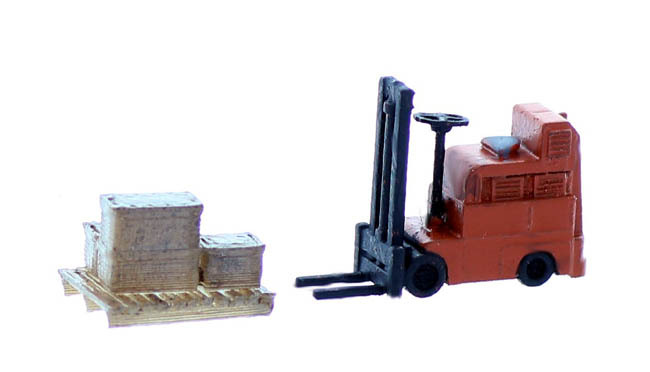 HO Scale Detailed Fork Truck. Comes Built up and Finished ready for your scenes. 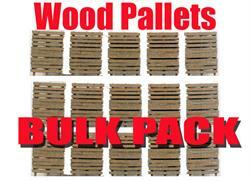 ***DOES NOT include the pallet / load **** They are available with our Warehouse worker #2 below on this page loading a pallet. NOTES: Comes all Finished for your....colors will vary as these are hand finished. 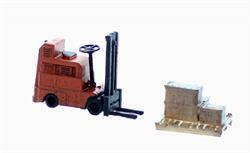 He's Stacking Freight boxes on a pallet to be picked up in today's shipment. 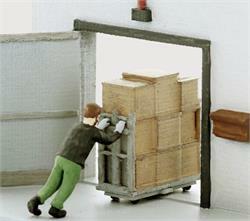 Perfect for a Loading dock, Warehouse or anywhere that needs that "In Action" figure touch to bring your scenes alive. HO Scale Detail Finished Set.